"They know what scares you." Sadly, this is can never be more false with Poltergeist. This supernatural adventure horror remake directed by Gil Kenan; adapted by David Lindsay-Abaire; based on the 1982 film of the same name created by Steven Spielberg. Legendary filmmaker Sam Raimi and director Kenan reimagine and contemporize the classic tale about a family whose suburban home is invaded by angry spirits. When the terrifying apparitions escalate their attacks and take the youngest daughter, the family must come together to rescue her. For those who are not familiar with the original, Poltergeist is a supernatural horror film directed by Tobe Hooper. It was co-written and produced by Steven Spielberg, but had a clause in his contract to prevent him directing another movie while he made E.T. the Extra-Terrestrial (1982). Therefore, Hooper was selected to direct based on his work on The Texas Chain Saw Massacre (1974). It is the first and most successful entry in the Poltergeist film series. Set in a California suburb, the plot focuses on a family whose home is invaded by malevolent ghosts that abduct the family's younger daughter. Released on July 29, 1982, the film was a major critical and commercial success, achieving in being the eighth highest-grossing film of 1982. Years since its release, the film has been recognized as a classic within the horror genre and has gained a cult following. Aside for being nominated three Academy Awards, the film was ranked as #80 on Bravo's 100 Scariest Movie Moments (The 'moment' being the clown attack scene) and the Chicago Film Critics Association named it the 20th scariest film ever made. The film also appeared at #84 on American Film Institute's 100 Years...100 Thrills, a list of America's most heart-pounding movies. 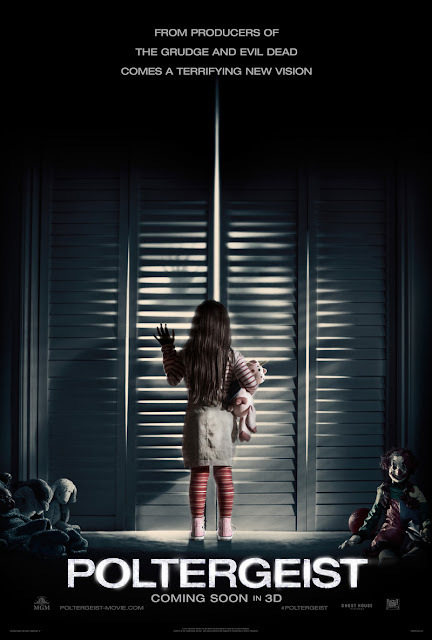 The Poltergeist franchise is believed by some to be cursed due to the premature deaths of several people associated with the film, a notion that was the focus of an E! True Hollywood Story. The film's success helped spawned a franchise consisted of two sequels and the remake. The film stars Sam Rockwell, Rosemarie DeWitt, Jared Harris, and Jane Adams. Despite the effort given by the cast, the modernised characterisations of the classic characters were less than stellar. Especially with Harris' Carrigan Burke and Clements' Madison Bowen. Both characters were weak and can never live up to Zelda Rubinstein's Tangina Barrons and Heather O'Rourke's Carol Anne Freeling. Low-key creepy rather than outright scary, the new Poltergeist marks a weak improvement over the original, partly because, from acting to poor scares, it is horribly executed; and partly because the filmmakers have downgraded the role of the expert, played in all her powerful glory by Zelda Rubinstein in the original and by a considerably more subdued Jared Harris here. Director Gil Kenan crams in every ghost cliché, from demonic faces to killer clown toys. This house springs so many FX shocks it plays like a theme-park ride. Result? It's not scary, just busy. For the real thing, watch The Shining . . . The Haunting . . . or The Innocents . . . What all those films have in common is precisely what the new Poltergeist lacks: They know it's what you don't see in a haunted house that fries your nerves to a frazzle. The poster for the film reads "Imagine a place where nothing is impossible." This is the basis for Tomorrowland. This science fiction mystery adventure film directed by Brad Bird, and co-written and produced by Bird and Damon Lindelof. The film tells the story of a former boy genius and a young girl bursting with scientific curiosity, who are bound by a shared destiny, as they embark on a mission to unearth the secrets of a place somewhere in time and space, a place that exists in their collective memory, an ambiguous dimension known as 'Tomorrowland'. Where their actions directly affect the world and themselves. 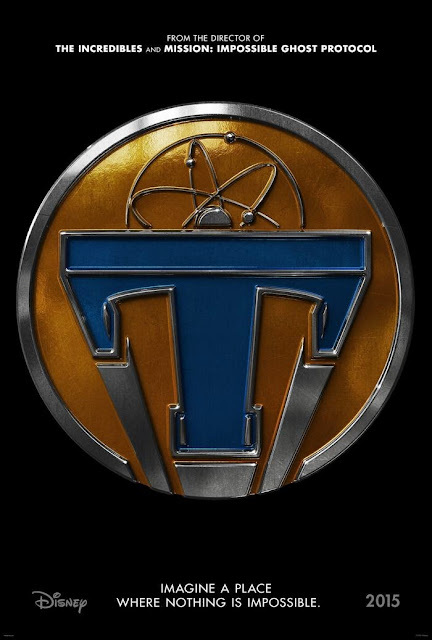 Walt Disney Pictures originally announced the film in June 2011 under the working title 1952, and later retitled it to Tomorrowland, after the futuristic themed land found at Disney theme parks. Lindelof signed on to write and produce it. In May 2012, Bird was hired as director. Later in November 2012, Clooney entered negotiations to star in the film. In February 2013, Laurie joined the film. In July 2013, Britt Robertson was cast. Tomorrowland, as first conceived by Walt Disney back in the 50's and 60's, was to showcase what the future would hold for the world. Bird and Lindelof's screenplay was heavily influenced by Disney's optimistic philosophy of innovation and utopia. On January 23, 2013, nearly a week before the title change, Bird posted a picture on his Twitter page related to the project. The image showed a frayed cardboard box labeled 1952, supposedly uncovered from the Walt Disney Imagineering developmental unit, and containing items like archival photographs of Walt Disney, Technicolorfilm, envelopes, a vinyl record, space technology literature, a 1928 copy of an Amazing Stories magazine, and an unidentified metal object. On August 10, 2013, Bird and Lindelof gave a presentation at the D23 Expo in Anaheim, California. They opened the "1952" box and revealed many of its contents. Later that day a pavilion was unveiled on the D23 Expo show floor which presented the items for close inspection by guests. The film stars George Clooney, Hugh Laurie, Britt Robertson and Raffey Cassidy. Despite the performances being superbly performed by the cast, some of the characters lacked motive, explanation, and development. Clooney gave another stellar performance despite being too charming to play a bitter old man. Laurie's character, despite being my favorite character, lacked the motive, explanation and development that I mentioned. And his reveal is rather underwhelming. Robertson gave an amazing performance, her only flaw was that her character lacked development here and there. Cassidy gave an incredible performance as a child of wisdom and knowledge. However, she lacked the grounded reality, or cynicism, that is often associated with wisdom and knowledge and sometimes bordered on the cliches of playing that archetypal character. It is a pity to see the Disney craftsmen doing what they do best on such a grand and risky scale with Tomorrowland and fail at it. If one has time for only one science fiction mystery adventure film this season, this is not the one to choose. The film suffers due to the fact that Bird and Lindelof desperately tried to fuse Disney's characteristic kiddie, schmaltzy, sentimental and naively optimistic flare, the park's innovative and imaginative ideals with Star Wars-style action and world-building in the space of a tight two hour running time. Also, see my review for Mission Impossible - Ghost Protocol. Week 19 has been a slow and yet unfortunate week for me. During this time, my roommates of 1005, with the exception of one, have all moved out due to the fact that their program had sadly come to a close. To add even more sadness to this event, a few days before this program was to end, my roommate Shane got termed ("fired") due to his record card having so many points. He was forced by housing to move out in an hour or otherwise security was to be called and have him kicked out to the curb. Literally! During this time, I got to have all of Apartment 1005 all to myself and with other roommate Harley. Alas, this was short lived. Without any warning, I was informed by Housing that I am to be kicked out of my apartment. Because I was falsely accused of acts I didn't even commit. And who was the one who accused me of this? It was none other than my roommate, Harley. He accused me of touching and eating his food, touching his clothes and trying to steal his girlfriend. As well as making her and her friends feel uncomfortable whenever they came over. For the first time in my life, I have never felt so betrayed and 'back-stabbed' by my own roommate whom I trusted and graciously bought tickets for him and his girlfriend for Mad Max: Fury Road, from the generosity of my heart. When I got there, I was fortunate to have my new roommates to help me move in. My new roommates consisted of two Mexicans, one Puerto Rican, one Brazilian and one Canadian. It was their first day in Disney. They just moved in an hour or two before I did. On the first day, we got to genuinely know each other and I knew that the time I had with these guys was going to be fine. And that we weren't going to have any problems at all. Here are some tidbits about my roommates; the two Mexicans are Franco Gonzalez and Jose Lopez. Franco is a Media major from Colegio Antonio Repiso in Ciudad Victoria, Tamaulipas. Jose is a Visual Arts major at Universidad Iberoamericana León. The Puerto Rican is Alejandro Padilla, a Hospitality and Management major from Universidad Anáhuac Cancún. The Brazilian is Marcos Carrilho from Goiânia. His major is unknown. He was the quiet and "keep to himself" type. I hardly saw him around. Lastly, the Canadian is David Miliken. A Sociology and Film major from Queens University in Kingston, Ontario. And there you have it, my new friends and life in 4006. Film Review: "Mad Max: Fury Road" (2015). "My name is Max. I was a cop searching for a righteous course... My world is reduced to a single instinct: Survive... As the world fell it was hard to know who was more crazy. Me... Or everyone else." This is the opening lines for Mad Max: Fury Road. This Australian post-apocalyptic action-adventure road film directed, produced, and co-written by George Miller, and is the fourth installment of Miller's Mad Max franchise. The first film of the franchise in 30 years. Fury Road is an apocalyptic story set in the furthest reaches of our planet, in a stark desert landscape where humanity is broken, and almost everyone is crazed fighting for the necessities of life. Within this world exist two rebels on the run who just might be able to restore order. There's Max, a man of action and a man of few words, who seeks peace of mind following the loss of his wife and child in the aftermath of the chaos. And Furiosa, a woman of action and a woman who believes her path to survival may be achieved if she can make it across the desert back to her childhood homeland. Plans for the fourth film crashed with financial difficulties and the project spent several years in development hell. The idea of a fourth installment occurred to Miller in August 1998 when he was walking in an intersection in Los Angeles. About a year later, while travelling from Los Angeles to Australia, the idea coalesced. The movie was all set to shoot in 2001, but was postponed due to 9/11. Miller then had to move on to Happy Feet (2006). Mel Gibson, who starred in the original three previous films was also set to reprise his role as the lead character. However, the infamous incidents that followed the years didn't permit him to. In 2003, Miller announced that a script had been written for a fourth film, and that pre-production was in the early stages. Although the project was given the green light for a US$100 million budget to begin filming in Australia in May 2003, the film entered hiatus due to security concerns related to trying to film in Namibia because the United States and many other countries had tightened travel and shipping restrictions. With the outbreak of the Iraq War, it was abandoned as it was considered a potentially politically sensitive film. Although Mel Gibson had been cast to return as Max, he lost interest after production was cancelled. Miller again confirmed his intention to make another Mad Max at the 2007 Aurora film maker initiative. However, he stated that he thought Mel Gibson would not be interested in the film because of his age. Heath Ledger was reportedly considered for the lead before his death in 2008. On 5 March 2009, it was announced that an R-rated 3D animated feature film was in pre-production and would be taking much of the plot from Fury Road, although Mel Gibson would not be in the film and Miller was looking for a "different route", a "renaissance" of the franchise. Miller cited the film Akira (1988) as an inspiration for what he wanted to do with the franchise. George Miller was also developing an action-adventure tie-in video game based on the fourth film, along with God of War II video game designer Cory Barlog. Both projects were expected to take two to two-and-a-half years, according to Miller, with a release date of either 2011 or 2012. Fury Road was going to be produced at Dr. D Studios, a digital art studios founded in 2008 by George Miller and Doug Mitchell. 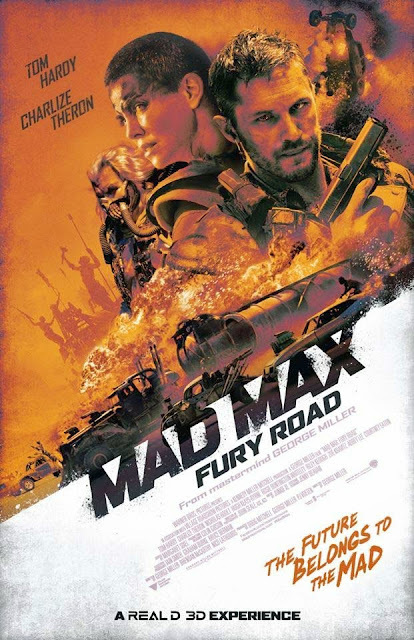 On 18 May 2009, it was reported that location scouting was underway for Fury Road. After exploring the possibility of an animated 3D film, George Miller decided instead to shoot a 3D live action film, and at this point plans to make the animated film were immediately dropped. In October 2009, Miller announced that filming would commence at Broken Hill, New South Wales in early 2011, ending years of speculation. This announcement attracted widespread media attention in Australia, with speculation at that time on whether Mel Gibson would return as Max. That same month, British actor Tom Hardy was in negotiations to take the lead role of Max, while it was also announced that Charlize Theron would also play a major role in the film. In June 2010, Hardy announced that he would indeed play a new version of Mad Max. In July 2010, Miller announced plans to shoot two Mad Max films back-to-back, entitled Mad Max: Fury Road and Mad Max: Furiosa. In November 2011, filming was moved from Broken Hill to Namibia, after unexpected heavy rains turned the desert there into a lush landscape of wildflowers, inappropriate for the look of the movie. And there the film went into motion and went into high-gear. Fury Road stars Tom Hardy as "Mad" Max Rockatansky, making it also the first Mad Max film not to feature Mel Gibson in the title role. The film also stars Charlize Theron, Nicholas Hoult, Hugh Keays-Byrne, Rosie Huntington-Whiteley, Riley Keough, Zoë Kravitz and Courtney Eaton. Though little dialogue was spoken amongst the characters, the cast gave incredible and amazing physical performances that would make a Michael Bay and John Woo film would look like amateurs. Hardy made a terrific Mad Max; Theron was a badass heroine and Keays-Byrne made a terrifying villain that topped The Toecutter and Lord Humangus. Mad Max: Fury Road has been consigned to mega budget blockbuster action films, where audiences are responding as Miller wants them to, like going on an unforgettable ride. From there the film will find its way to film schools and lecture halls, where its old-fashioned approach to filmmaking and tough-gutted intelligence may be appreciated. It manages not to waste a single frame of film even as it wastes countless motorcycles, automobiles and other vehicles across the harsh dessert landscape of Namibia. The film, like its predecessors, is a straight forward fusion of two B-movie genres popular in the 1970s: the car chase film and the vigilante revenge film. Shows nothing but skillful filmmaking, a film of pure action, of kinetic energy, and is the most relentlessly aggressive movies ever made. The film's signature car chase is unbelievably well-sustained and the special effects and stunts are spectacular, creating a frightening, sometimes disgusting, and (if the truth be told) exhilarating effect. In conclusion, the film is, without a doubt, the best action film of the century, and by far the best film of the year. 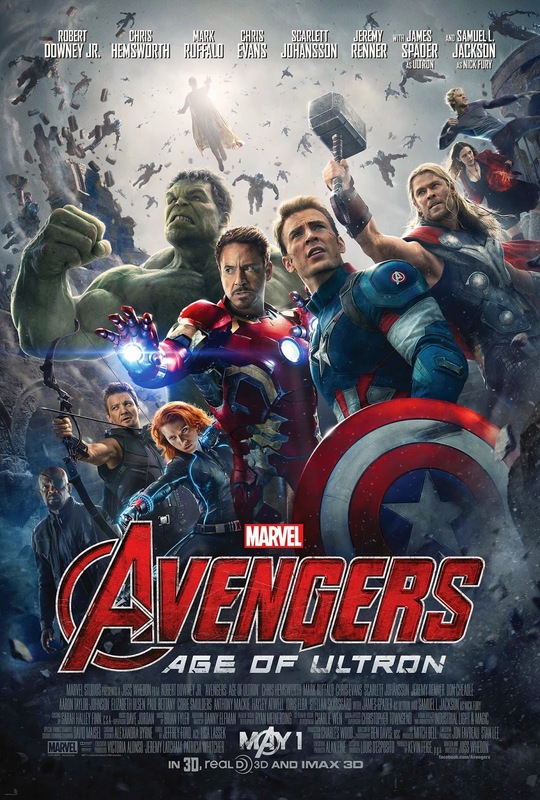 Film Review: "Avengers: Age of Ultron" (2015). “I know you're good people. I know you mean well. But you just didn't think it through. There is only one path to peace... your extinction”. This is what the Avengers face this time round in Avengers: Age of Ultron. This superhero film based on the Marvel Comics superhero team the Avengers. It is the sequel to 2012's The Avengers and the eleventh installment in the Marvel Cinematic Universe. The film was written and directed by Joss Whedon and produced by Marvel Studios. When Tony Stark tries to jumpstart a dormant peacekeeping program, things go awry and Earth's Mightiest Heroes, including Iron Man, Captain America, Thor, The Incredible Hulk, Black Widow and Hawkeye, are put to the ultimate test as the fate of the planet hangs in the balance. As the technological and villainous enemy Ultron emerges, it is up to The Avengers to stop him from enacting his terrible plans of human extinction, and soon uneasy alliances and unexpected action pave the way for a global adventure. The film features an ensemble cast that includes Robert Downey Jr., Chris Hemsworth, Mark Ruffalo, Chris Evans, Scarlett Johansson, Jeremy Renner, Don Cheadle, Aaron Taylor-Johnson, Elizabeth Olsen, Paul Bettany, Cobie Smulders, Claudia Kim, Anthony Mackie, Hayley Atwell, Idris Elba, Stellan Skarsgård, James Spader, and Samuel L. Jackson. The cast gave mighty performances and all of them vastly improved their roles from the previous film and other Marvel films. I love the developments of the characters, especially with Renner, Ruffalo and Johansson. It was great to see Hawkeye have a bigger role than the last film, as well as seeing an unexpected but interesting romance between Hulk and Black. Widow. But the one character who stole the show was none other than Ultron. Spader was Joss Whedon's first and only choice for the role of Ultron, because of his "hypnotic voice that can be eerily calm and compelling while also being very human and humorous". On James Spader's first day on set, the cast was so impressed by his performance that they applauded and cheered for him after his first take. For this film, not once does Spader overtly ask for the audience's sympathy and horror, but through a disciplined, suggestive performance he dominates the film. Also, kudos to Bettany, as Vision, who was electrifying. Kim as Dr. Helen Cho and Serkis as Ulysses Klaue, even though it is considered a cameo. In conclusion, Avengers: Age of Ultron is a spectacular piece of work that carries the Marvel tradition forward. Breathtaking in scope, the film also shows the birth of Ultron, brilliantly portrayed by James Spader, as he is on a mission to destroy the Avengers and be “the peace of our time”. Director Joss Whedon imaginative supervision of the Marvel Cinematic Universe gives this second part of the Avengers series a truly epic dimension, adding a mature, philosophical aspect to the nonstop barrage of brilliant special effects. However, it is not as well structured as the first film, it is easy to say that this is not better than the first film. But it has the single greatest villain in the Marvel Cinematic Universe, a real coup de cinéma. Even though it suffers only from the familiarity with the effects generated in the original and imitated too much by others. However, it is a worthy sequel to the first film, equal in both technical mastery and characterization. Also, see my reviews for Much Ado About Nothing and Guardians of the Galaxy.